With Data Studio, you can easily access and analyze data from Google Cloud and Google Marketing Platform sources alongside more than 500 other data sources via more than 100 partner-built connectors. This means you can visualize and interactively explore data in compelling dashboards or reports, easily share insights with others or collaborate in real-time with colleagues, whether you’re sitting across the room or across continents. As a result, it’s now being used by over a million people around the world, every single month. Data Studio beta users have influenced the product’s evolution and inspired our vision for its future. We recently introduced Data Studio Explorer, an ad-hoc data exploration component of Data Studio. Its native integration within BigQuery’s UI gives our users the ability to turn their datasets and query results into a visualization, literally in a few clicks. Blending data from disparate sources in a single chart is also now as simple as a right-click inside Data Studio. It’s as easy as a right-click to blend data from disparate sources in the same chart. We hope you recognize that the team is just getting started with Data Studio! We’ll continue to release new features and additional enhancements to the product. In the meantime, you can get started by visiting datastudio.google.com, connecting to your data sources, and exploring our template gallery. As always, feel free to ask us questions and send us feature requests. Data Studio is your product as much as it is ours. Data processing techniques and tools may have evolved, but one headache in data processing has remained constant: bad input data with anomalies, gaps, and inconsistencies. Taking action on bad data often leads to bad results, but cleaning and preparing data typically requires a lot of time and coding from developers and subject matter experts. We believe data preparation is important and allows you to unlock the full potential of cloud data analytics tools like BigQuery and Google Cloud Dataflow. 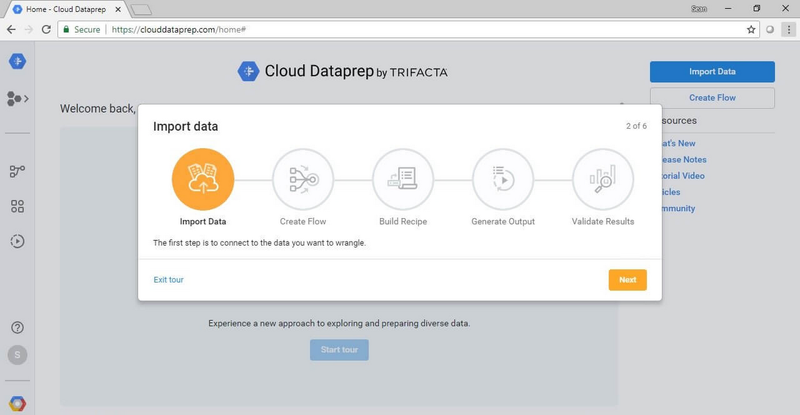 We introduced Google Cloud Dataprep to make data preparation easy, fast, and powerful through an intuitive and serverless visual interface, As of today, it is generally available. We’re launching the general availability of Cloud Dataprep with a number of new features frequently requested by our user community. These new features make it easier to do the core tasks involved in data preparation: exploring, cleaning, and enriching data. A new look: The landing page for Cloud Dataprep has been updated to show recent activity, and new users will get up-to-speed quickly with an improved onboarding experience. Team-based data preparation: Teams can now collaborate on data preparation by sharing flows, collaborate on recipes in real-time, re-using samples, and reviewing an audit trail to see who did what and when. Powerful features for business analysts: Business analysts can be more productive with Google Sheets-like pivots and unions, improved source:target schema matching, and parameter-based dataset processing. On any given day, Cloud Dataprep has organizations scheduling thousands of predefined jobs or performing ad-hoc data preparation. You can easily get started exploring, cleaning, and enriching your data by following one of our how-to guides. Since Cloud Dataprep is serverless, if you’re an existing user, all of these new features are immediately available and existing jobs do not require modification. For more information, you can always review the Cloud Dataprep release notes and use the google-cloud-dataprep tag on Stack Overflow for questions. When combined with BigQuery, our fully-managed and easy-to-use enterprise data warehouse, Data Studio and Cloud Dataprep comprise key components of Google Cloud’s business intelligence and marketing analytics solutions. Keep an eye on this space as we continue building out features and enhancements, based on your experiences and feedback. In the meantime, ready your data for analysis and machine learning with Cloud Dataprep or start exploring and visualizing all your critical data with Data Studio.